- What's the Good Word? 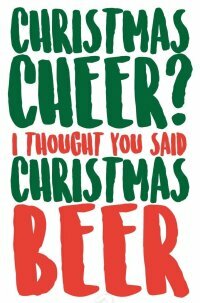 Want to make the craft beer lovers in your life ecstatic for the holidays? Serve up the gift of amazing, exclusive cask ale by giving tickets to our ATLANTA CASK ALE TASTING and CLASSIC CITY BREW FEST. Follow the links above to purchase and print out tickets to insert into holiday cards. 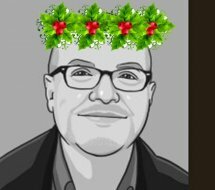 Spread some cask ale cheer this season! These are Georgia's favorite craft beer events! Frank Boon ranks as one of Belgium’s most noted lambic brewers and blenders. Boon has a passion for this complex, refreshing, historic style of spontaneously fermented ale, and he never misses an opportunity to share his enthusiasm. 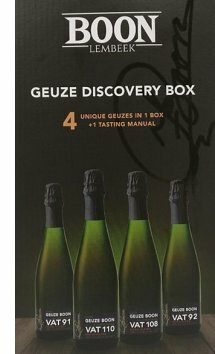 Any lover of authentic lambics should seek out the new Boon Geuze Discovery Box that includes four bottles of sparkling lambic - each from a different wooden vat in the Boon facility in Lembeek, Belgium. Each vat imparts a unique set of aromas, flavors and personality to its beer, and sipping the lambics from the four vats side-by-side provides a fascinating and delicious experience. This wooden foeder once served as a calvados vat in Normandy, France. Its beer offers pleasant notes of apple, pear and grape, along with subtle acidity. Once filled with red wine from the Rhone Valley in France, vat 92's Geuze presents deep, rich aromas and a complicated flavor profile of spice, apricot, kiwi, apple and a hint of smoke. Beautiful berry notes also permeate this lambic. A cognac storage vat in its former life, vat 110 creates lambic that comes across as slightly dry with hints of spice, vanilla, citrus and earthy honeydew melon. The Brettanomyces character provides traces of leather and a pleasing farmhouse character. Like a floral, pleasantly acidic white wine, the beer from this vat boasts a beautiful grape must character backed by notes of honeysuckle and jasmine. The aged, oxidative quality leads to a smooth, soft mouthfeel with silky palate sensations that are quite impressive and elegant. Good Word Brewing & Public House, a new brewpub concept from the guys behind Brick Store Pub, opened a few days ago in Duluth, Georgia. Located in Duluth’s Parsons Alley restaurant area, Good Word features tasty food items and house-made beers that are interesting, flavorful and highly drinkable. Good Word owner and brewer Todd DiMatteo told The Gwinnett Daily Post, "Good Word will be completely different from Brick Store Pub because, whereas the Decatur business is a beer bar, the Duluth restaurant will be a brew pub where the beer is made in-house. The food menu at Good Word is also different from the one at Brick Store," he said. At present, DiMatteo is offering a house IPA, hoppy blonde ale, American sour ale and an English mild ale. Other taps are pouring select craft beers from around Georgia and elsewhere. John Sukroo, Duluth resident and craft beer enthusiast, commented, "It's wonderful to have a craft beer location like this in Duluth, and I look forward to trying each and every beer that Todd cranks out." 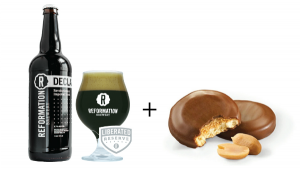 This winter, seek out Reformation's 7.4% ABV Scout Festive Stout brewed with fresh ginger and a variety of spices. In addition, Declaration Stout sees its re-release in 22-ounce bottles with a newly designed label, and this dark brew pairs extremely well with all types of chocolate. 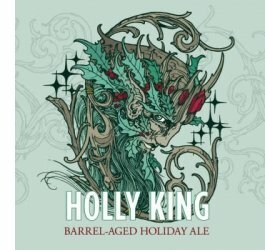 Reformation's Jessica Miller shares, "On December 3, don ye now your ugly sweaters at the brewery in Woodstock, Georgia. There will be a food truck, live music, half-off pints for folks in the food and beverage industry and prizes for ugliest sweaters. In January, Reformation anticipates being underway with renovations on a second location in downtown Woodstock that will house a dedicated R&D brewhouse, taproom and adjoining green space." Atlanta's Second Self celebrates crisp weather with its crisp JunIPA, a 6.4% ABV, 43 IBU ale inspired by gin and brewed with Amarillo and Cascade hops plus juniper berries. The new version is "dry-herbed" with juniper and rosemary. 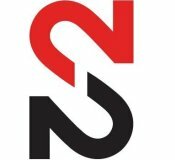 Also keep eyes peeled for Second Self's Olde Oyl imperial stout with dark malts and oats, the red velvet cake-inspired Bleeding Heart amber ale with cocoa and vanilla, and an exciting new collaboration beer with Atlanta's Urban Tree Cidery. 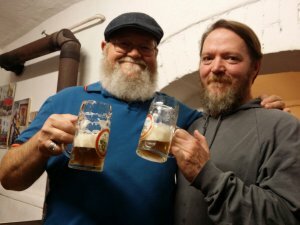 CLICK HERE to check out Owen's video highlights from his recent Brewtopia beer group trip to Germany. The video features footage from Weihenstephan, Hofbrauhaus, Schlenkerla, and Weyermann Malts. Aldersbacher Kloster Weisse Dunkel offers complex notes of wheat, clove, caramel and dark fruits - all showcased in a smooth, creamy, highly drinkable German-style dark wheat ale base. Try a bottle alongside roast turkey and stuffing. Cuvee des Jacobins Prestige Flemish Sour Ale ranks as a classic, reddish brown, acidic ale from Flanders, Belgium. Expect nuances of cherries, pomegranates, passion fruit, and light toffee. This tart, complex ale is like heaven with a slice of vanilla cheesecake. SweetWater Fresh Sticky Nugs. An impressive, dank, robust imperial IPA, this offering also sports the intense haze that's all the rage right now. At 8% ABV, this potent IPA packs alcohol warmth alongside a bold hop nose and palate. Sip it while munching on a chunk of dry, salty Parmigiano-Reggiano cheese. Jekyll Brewing just launched a New England-style IPA called Southern Juicy Juice. Expect a hazy, chewy, citrusy ale packed with notes of grapefruit zest and fresh pineapple. Topped by a creamy, white head, this ale delivers an intense hop character but remains approachable and dangerously quaffable. Wild Heaven Mavis comes in as the third of Wild Heaven's barrel-aged sour ales packaged in gorgeous 500ml bottles. Fermented with a mixture of Brettanomyces and Lactobacillus microbes in Bordeaux barrels, Mavis' wild aroma and flavor profile is enhanced with added blackberries, raspberries and cranberries. Terrapin Panama Krunkles is an American-style IPA with a twist from additions of pineapple and papaya that complement the beer's already tropical hop personality. Rich, pale malts balance the fruit and hop character, producing a wonderfully enjoyable ale that pairs well with Thai coconut curries. Southbound's Moonlight Drive winter seasonal ale is an 8% ABV imperial coffee stout with coffee roasted at PERC in Savannah. Southbound and PERC change up the coffee bean selection each year, creating a variety of cocoa, espresso notes in each annual batch of Moonlight Drive. This rich ale makes a perfect accompaniment to fruit pastries and almost any type of decadent doughnut. Virginia's Starr Hill Brewery has unveiled its Box of Chocolates sampler pack of four strong stouts - each with a different chocolate personality. Included are Double Bass with cocoa, Peppermint Double Bass with mint chocolate notes, Chipotle Double Bass with smoked peppers and chocolate, and Mocha Double Bass with bittersweet, roasted cocoa. Maybe life IS like a box of chocolates? 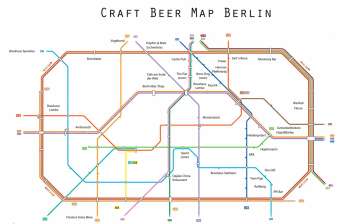 Owen Ogletree braves the winter chill next week to visit the best craft beer outlets in Berlin, Germany and Warsaw, Poland. Watch for photos and highlights!